'By the sea side', 'Beautiful Bloom Border ', and 'Mermaid Kisses'. I mixed them up to create some fun cards. I followed a common theme of the ocean on all three cards. I started by creating a mask by die cutting a scalloped heart out of some Mudra masking paper and inking up the heart using Tim Holtz distress inks and distress oxides in ocean colours. For the first card, I used a sponge dauber to apply the ink to create a bubble effect. 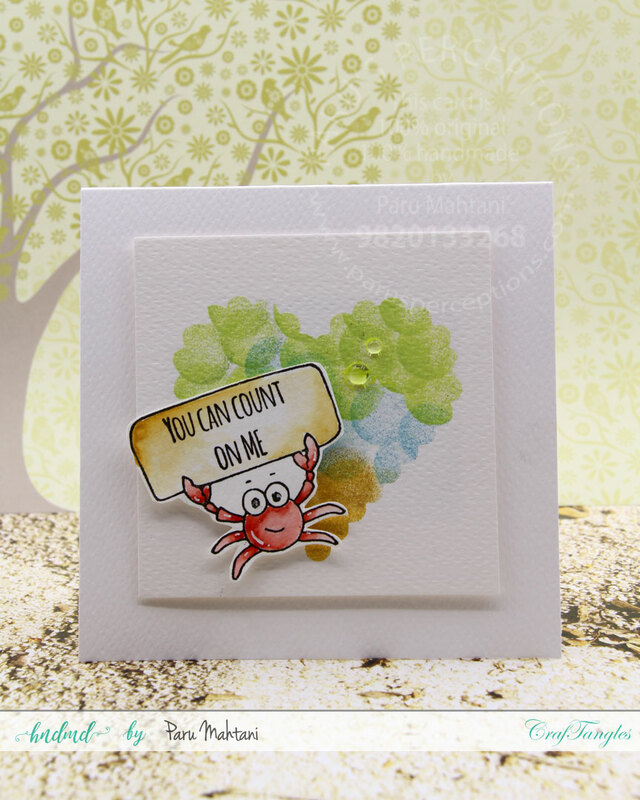 I stamped the crab from the Craftangles 'By the sea side' stamp set on a piece of scrap watercolour paper and coloured it with Sakura Koi watercolours. 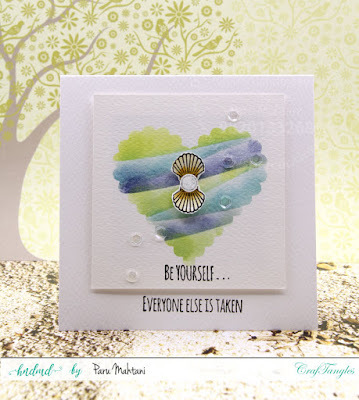 I then stamped the sentiment from the Craftangles 'Beautiful Bloom Border' stamp set. I added a couple of glass bubbles and used fun foam to mount the card on a 5" square card base. I used the scalloped heart mask as well as a mask to create the waves. to create an oyster shell. from the same set in London Fog ink. I then coloured the bubble using a white Signo gel pen. I mounted the bubble with double sided foam tape on the shell to create a pearl. I then popped up the two sides of the shell with double sided foam tape to create a 3D shell look. I added some clear sequins from Craftangles for interest. I then stamped the sentiment from Craftangles 'Beautiful bloom border' stamp set and mounted the panel with fun foam on a 5" square card base. For the third card, I pounced colour through the heart mask, to create large circular smudges. 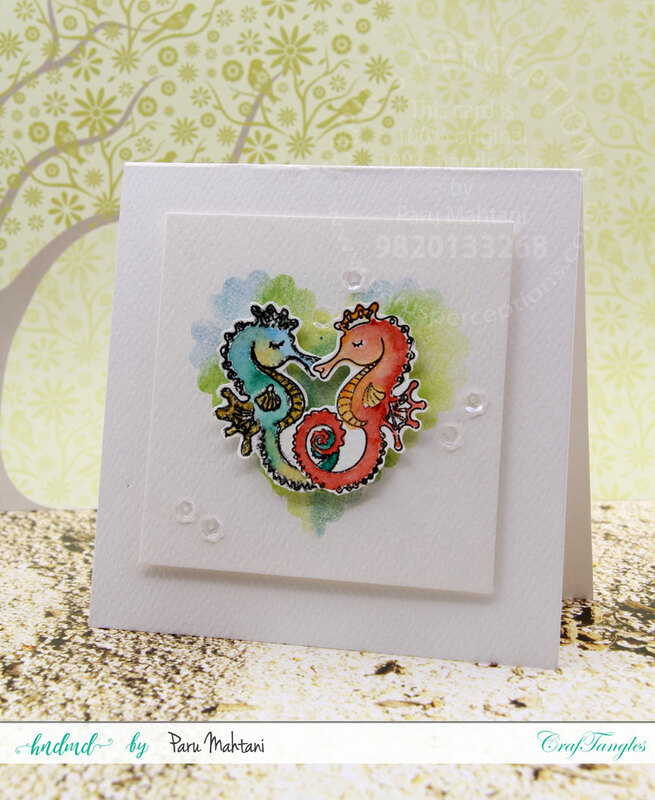 Craftangles 'By the Sea Side' stamp set. I used the mirror stamping technique to create a mirror image of the sea horse..this was quite a challenge!!! I then fussy cut the sea horses and overlapped the tails to create an illusion of them being intertwined. I added some Craftangles clear sequins to add some interest. I decided not to add a sentiment to this card. I think the image says it all! I mounted the panel using fun foam onto a 5" card base to finish the card. For the 4th card, I used the same scalloped heart mask and blended the inks to create an ocean. I stamped the fish through the mask to create the background. 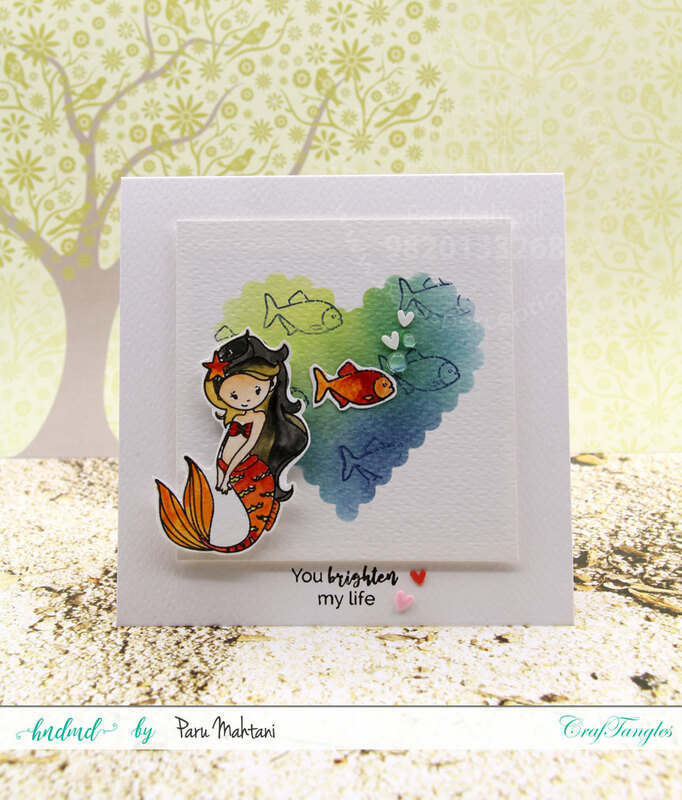 I then stamped coloured the mermaid and the fish, from the Craftangles 'Mermaid Kisses' stamp set on watercolour paper and fussy cut them. I then adhered them using glue and double sided foam tape. 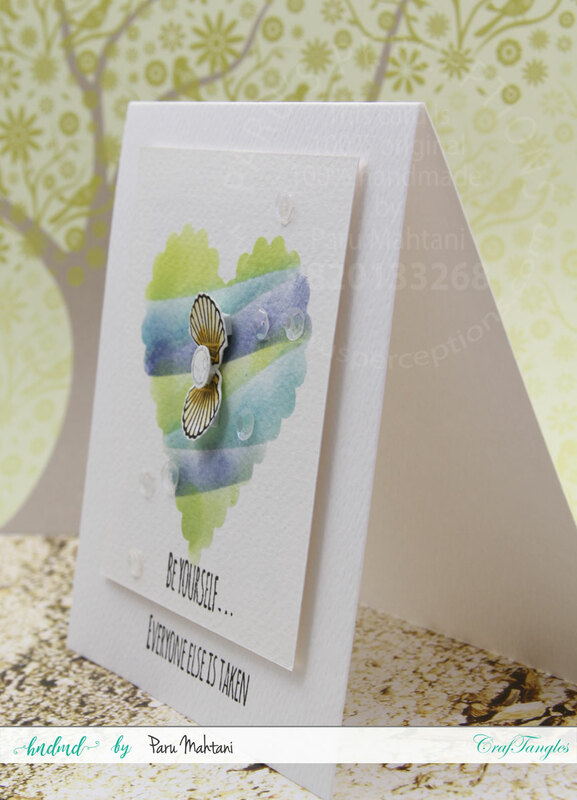 I stamped the sentiment form the Craftangles 'By the Sea Side' stamp set and embellished the card using glass bubbles and plastic heart sequins. I then mounted the panel using fun foam onto a 5" card base to finish the card. Here is a video showing my process. I hope you enjoyed this post and will be inspired to mix and match your Craftangles stamps to make some unusual cards! Thanks so much for taking time to leave a comment! It is much appreciated! Update...And Tons of Stamps for Sale! This is a Flickr badge showing public photos and videos from paru's perceptions. Make your own badge here.